Nikon has today unveiled the D5200, a new 24.1-million-pixel DSLR equipped with a metering sensor, AF and scene recognition system borrowed from the D7000. The DX-format D5200 deploys Nikon’s Expeed 3 image processor, designed to enable faster processing and improved noise reduction, for example. The ‘mid-range’ D5200 will join the 18-month-old D5100, a 16.2MP DSLR set to continue in the range, said Nikon DX product manager Simon Iddon. Promising a ‘massive leap in image quality’, the 505g newcomer is equipped with a 2,016-pixel RGB metering sensor and 39-point AF system plucked from the two-year-old D7000 – a 16.2MP model. The D5200’s AF system includes nine cross-type sensors in the centre. Firepower also includes a 921,000-dot, vari-angle, 3in LCD screen, five frames-per-second shooting, a top ISO of 6400 (extendable to 25,600) and full HD video. The D5200 is due out in December, priced £719.99 body-only, and £819.99 for a kit that includes an 18-55mm VR lens. Speaking at a press conference in central London, Iddon said the D5200 is targeted at the ‘real hobbyist’ – someone in the 25-50-year-old age range who is seeking ‘creative expression’. Shooting options will include seven in-camera special effects such as Selective Colour and Night Vision, plus HDR and D-Lighting. When asked who made the imaging sensor, Nikon UK’s group marketing manager Jeremy Gilbert replied that it was ‘Nikon-developed’. The D5200’s movie mode makes use of 3D-subject tracking and a built-in stereo microphone. Nikon D5200 photographers will have the option of attaching a WU-1a wireless adapter – allowing them to transfer images to mobile devices that use the Android or Apple operating systems, for sharing on social networking websites. The camera is also compatible with Nikon’s optional GPS unit, the GP-1. Nikon has also today announced a new wireless remote trigger system, the WRT10 transmitter and WRR10 transceiver, which uses radio waves to control up to 64 cameras at a time, explained Iddon. A price and launch date for this had yet to be announced at the time of writing. The D5200 will be available in a choice of black, red and bronze. 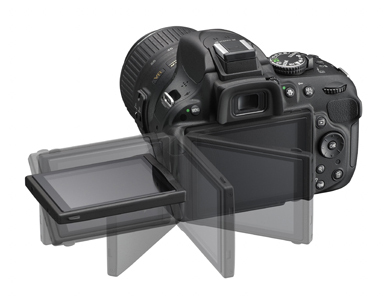 • Amateur Photographer understands that Nikon opted not to install a touch-sensitive screen in the D5200 as it placed greater importance on kitting it out with 39-point AF. Nikon says it is constantly monitoring the market, however, and has just completed the 19th of its latest customer surveys across Europe, according to Gilbert. The market research, some of which is conducted in London, involves Nikon staff observing customers through a ‘one-way mirror’ to gauge their reaction to Nikon products. Gleaning consumer feedback appears to be paying off for Nikon which is riding high on buoyant sales figures. The company says latest data suggests that its D3100 DSLR has grabbed more than 20% of the UK market every week for the past six months.